Juventus boss Massimiliano Allegri has joked about learning English amid rumors linking him with a move to Arsenal. Following the Gunners’ humiliating 5-1 defeat at the hands of Bayern Munich this week, it is now evident that a majority of the Arsenal fan base wants current boss Arsene Wenger to be replaced at the end of this season. The Gunners seem to have already begun looking for possible replacements for the Frenchman, and one such potential candidate identified by their board, as per reports, is current Juve coach Massimiliano Allegri. 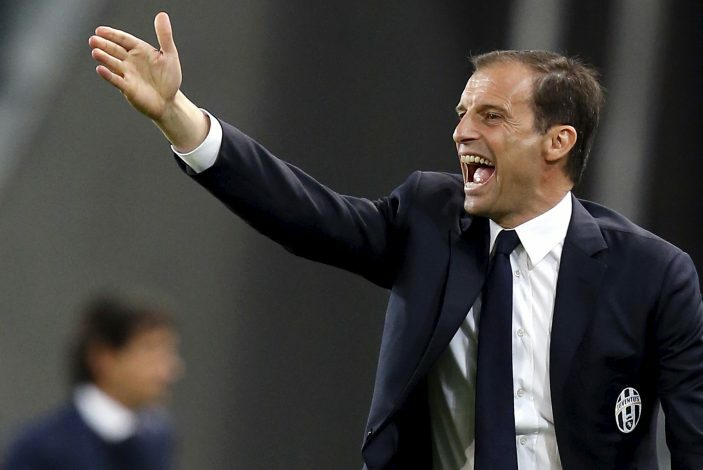 Allegri has been in-charge of Juventus for three years now, after having replaced Antonio Conte as the manager of the Turin-based outfit back in 2014. He has since helped the Old Lady club win two Serie A titles and two Copa Italias, whilst also taking them to the finals of the Champions League in 2015, where his men were beaten by FC Barcelona. But at the moment, the media continues to strongly link him with a move to the Premier League, and his future with the reigning Italian Champions seems far from secure. However, Allegri was recently seen addressing the Arsenal rumors himself, when he spoke to the media after his side’s 4-1 win over Palermo in the Serie A on Friday.